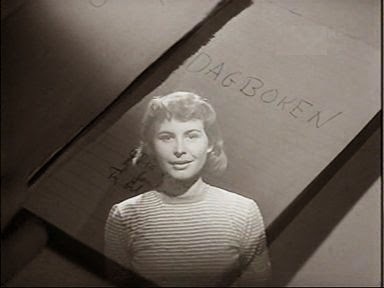 Ingmar Bergman’s Summer Interlude (Sommarlek, 1951) displays a continuation of the turn he had taken with his previous film, To Joy (1950), towards a more personal and existentialist perspective. As in To Joy, the concerns expressed in Summer Interlude are not just about romantic love, but about who we are and what we ultimately find fulfilling. And once again a horrible, unexpected, and unexplainable tragedy must be dealt with without eternal bitterness. But this time the focalization is not on a man, but on a woman and her perspective, something that would be increasingly characteristic of Bergman’s film over the ensuing years. In both To Joy and Summer Interlude, Bergman was expressing something difficult to put in towards – something about the pure exquisiteness of life, itself – which provides a manifestation of what cinema can offer beyond the written word. And crucial to this cinematic presentation is the emotive expressiveness of his leading actress in both films, Maj-Britt Nilsson. Ms. Nilsson’s performances in these films are remarkable for their sensitivity, depth, and range of feeling, and watching her performances makes me suspect that she was Bergman’s greatest actress. 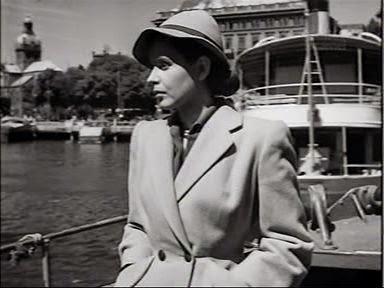 Another relatively “new” aspect of Bergman’s work that appears in Summer Interlude is the turn towards outdoor settings. Earlier Bergman films were very much studio productions, with carefully crafted and theatrical moving-camera shots of long duration that needed to be blocked out in the studio. In Summer Interlude, though, Bergman’s cosmos seems to have been liberated and opened up to the natural world. The camera shots are shorter in length here, but still the compositions and visual pacing are masterful. 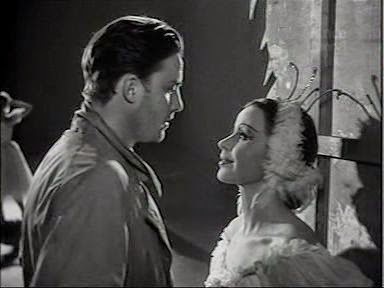 In fact Bergman, himself, has said that it was only with Summer Interlude that he first began to feel confident about his capabilities of cinematic expression . The narrative structure has five parts, or acts. Marie (played by Maj-Britt Nilsson) is a successful ballerina and preoccupied with rehearsals for a performance of “Swan Lake”, which is to open shortly. Just before a last dress rehearsal, she is presented with an anonymously posted diary written by her first boyfriend, Henrik, whom she had met thirteen years earlier on her summer holiday when she was fifteen years old. This prompts her to remember those old days. A theater lighting fault causes the dress-rehearsal to be postponed until that evening, so Marie has the afternoon off. On the street she sees David Nyström (Alf Kjellin), her boyfriend and a newspaper writer, and the two of them quarrel about each being too busy and selfish to attend to what the other wants. On an impulse, Marie then takes a ferry to an offshore island, which we will learn was the scene of her summer romance thirteen years earlier. Upon arrival she finds the cottage where she sometimes slept and begins reminiscing about those old days. In flashback, Marie is a teenage ballet student who has attracted the worshipful admiration of a shy and sensitive young college boy, Henrik (Birger Malmsten). During summer vacation, when many people in Sweden seek to get away from it all during the relatively short warm period, they meet on the holiday island and begin seeing each other, going boating, swimming, and walking around the island. They are usually accompanied by what Henrik says is his only friend, his shaggy dog, “Gruffman”. Aware that Henrik is shy and insecure and that he is attracted to her, Marie takes the lead in advancing their relationship. In fact with her effervescent enthusiasm taking over, she basically seduces him. Back to the present, Marie pays a visit to her aunt’s old house on the island, which is now shuttered. By chance, she runs into Uncle Erland, who has been bird-hunting. They haven’t seen each other for over ten years, and their interaction is cold, in fact almost venomous. Erland is still the rogue and reveals his cynicism about life. He reveals that he is the one who sent Henrik’s old diary to Marie, and she is resentful about this and other aspects of her uncle. In a revealing statement she says she regrets ever having let him touch her. She then takes the ferry back to the mainland. While on the ferry, Marie reminisces more about that fateful summer. She remembers more of their carefree frolics, and their quarrels, too. She also remembers some ominous moments when she suddenly became scared about the unknown – sometimes when things became too quiet or when an owl mysteriously screeched in the woods. The world was full of magic then, but there was a vague menace, too. Three days before the end of their glorious summer holiday, Marie and Henrik are thinking about their tasks back on the mainland. Henrik wants to go for one last swim. They kiss, and then he takes his dive off a cliff, but it was misguided and Henrik crashes to his death on the rocks. Up to this point, Marie has taken her journey into the past, but she has made little progress with her inner demons. She still hates Erland, and she still hates herself for forgetting Henrik. The reviewing of Henrik’s diary has brought back happy memories, but also horrible traumas. Back at the rehearsal theater with the lighting fixed, they rehearse for the performance of “Swan Lake”. Afterwards in her dressing room, she talks to the ballet master (Stig Olson), who taunts her about the emptiness of people’s goals in life. He compels her to admit that her life is ultimately empty, other than when she is on the dance floor and immersed in her art. To some extent this is almost a reference to the theme of To Joy, which partly conveyed this idea of artistic engagement as the ultimate end. 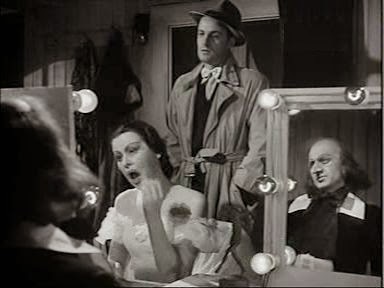 Note that in this dressing-room scene, we return to some theatrically staged moving-camera shots characteristic of Berman’s earlier films. There are several shots featuring complex moving-camera compositions that last over one minute, and one shot takes almost three minutes. After the ballet master departs, Nyström shows up in the dressing room, and again they quarrel. Marie is fed up with his self-centeredness, and she says she wants to break up with him. He leaves in a huff, and Marie continues to wash away her makeup. As she stares at herself in the mirror, though, the accumulated days’ experiences seem to have an effect on her. She seems to have an epiphany, and smiles impishly at her reflection. Engagement with life has its own immediate rewards. During the ballet performance the next evening, Nyström shows up and watches her from the stage wings. Between sets Marie comes up to him and sincerely and unreservedly kisses him. She is refocused on the sweetness that can be found in life as she lives it – not only with her art, but with Nyström and others, too. As mentioned, Bergman’s cinematography is very expressive and assured in Summer Interlude. There are arresting moments in the outdoor shots on the island. Particularly memorable are some shots of Marie, in the present, when she first visits the island and sees an old woman walking by who looks like a wraith or a symbolic figure from a masque. On this occasion Marie follows the woman for awhile through the woods, which evokes her penetration into a half-forgotten past. 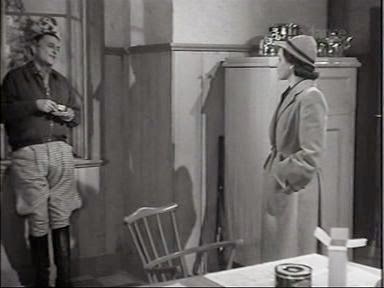 The scenes of Marie and Henrik having their fun on the island are also effective. They are often composed in closeups, but the visual flow is inevitably fluid. But perhaps the key to the overall presentation is the performance of Maj-Britt Nilsson as Marie. She has to play an accomplished dancer in her late twenties as well as a bubbly teenager of fifteen, and convey not only that difference in age, but a difference in outlook. And she does so convincingly. In the end, we are left with a feeling that is not just resignation to the ups and downs of life, but is an affirmation of the opportunities for ecstasy that can unexpectedly appear all around us in the present. We must not miss out on these opportunities. Perhaps this note of affirmation is even more emphatic here than in the conclusion of To Joy. 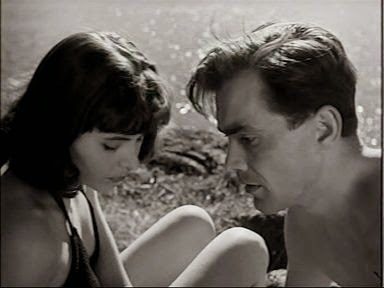 Peter Cowie, “Summer Interlude: Love and Death in the Swedish Summer”, The Criterion Collection, May 29, 2012. Wonderful film, excellent commentary. I noticed an unusual aspect of this film when I watched it recently. There is a minor exchange between Marie and Henrik about Superman. Something to the effect that he is not Superman, to which she responds that she is glad because she would find Superman's costume a bother. Quite an odd exchange in the context of her current love interest being David, a newspaper reporter who dresses in hat and trenchcoat a la Clark Kent. It seems in keeping with the subject material since both characters wrap themselves in their work to the detriment of their potential engagement.